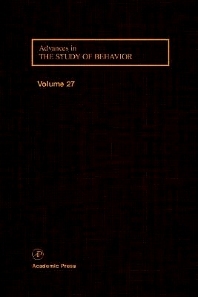 D. von Holst, The Concept of Stress and Its Relevance for Animal Behavior. V. Apanius, Stress and Immune Response. P.A. Parsons, Behavioral Variability and Limits to Evolutionary Adaptation under Stress. A.P. Møller, Developmental Instability as a General Measure of Stress. S.L. Lima, Stress and Decision-Making under the Risk of Predation: Recent Developments from Behavioral, Reproductive, and Ecological Perspectives. G.A. Lozano, Parasitic Stress and Self-Medication in Wild Animals. R. Thornhill and F.B. Furlow, Stress and Human Behavior: Attractiveness, Women's Sexual Development, Postpartum Depression, and Baby's Cry. D.M. Broom, Welfare, Stress, and the Evolution of Feelings. H. Hofer and M.L. East, Biological Conservation and Stress. Chapter References. Subject Index. Advances in the Study of Behavior continues to serve scientists across a wide spectrum of disciplines. Focusing on new theories and research developments with respect to behavioral ecology, evolutionarybiology, and comparative psychology, these volumes foster cooperation and communication in these diverse fields. Experimental psychologists studying animal behavior, comparative psychologists, ethologists, evolutionary biologists, and ichthyologists. Dr. Peter Slater is a Kennedy Professor of Natural History at the University of St Andrews, in Scotland. He is a former Editor of the journal Animal Behaviour and past President of the Association for the Study of Animal Behaviour. He received the Association's medal in 1999. His research interests are in vocal communication, with emphasis on the development and organization of song in birds. University of St. Andrews, Fife, U.K.